It’s Thursday night. A full moon spotlights the gray tombstones of the Hollywood Forever Cemetery, the iconic Los Angeles graveyard known as the final resting place of the stars. Inside the cemetery’s Masonic Lodge, dozens of candles light a pathway up a flight of stairs. Eerie choral music plays as guests enter the auditorium where five regal, but vacant chairs face the crowd. A dense fog rolls across the empty stage, briefly obscuring the backdrop’s crimson hue. The second ever installment of the Secret Society of the Sisterhood is about to begin. Some attendees linger in the Eastern Star room, where artists Brenda Chi and Stevie Wilson have set up a table of their wares for purchase. As it draws closer to 8 p.m., everyone filters into the red room to choose their seats. A casual glance reveals most of the attendees are women. Five women soon enter draped in heavy scarlet cloaks, each carrying a white, tapered candle. They use these candles to light others fitted on a black candelabrum, then take their thrones. It has all the pomp and circumstance of a midnight sabbat—or at least the way films predict those witchy gatherings to be. Secret Society creator Trish Nelson takes the stage and invites us to grab the hands of our neighbors as we join her in a call-and-repeat oath. It begins seriously enough; we promise one another loyalty and empowerment and the same to all women— except to, the oath deviates, you know… “a Melania.” But, maybe not. Nelson ponders if she is being too hard on her. The oath begins to meander into a long spiel, contemplating what it’s like to be Melania Trump and what she might do to undermine her “bloated, useless husband.” It’s unclear if we are meant to continue repeating after Nelson, but about half the crowd makes it through to the end. Nelson is no stranger when it comes to providing a platform for women to tell stories. Nelson, who grew up in Orange County, spent over a decade in New York as the founder of website/production company BanterGirl, and the producer of NYC literary salon Women of Letters. After her recent return to Southern California, she knew she wanted to do something similar in Los Angeles. The moment she saw photos the Masonic Lodge, she was certain it would become her next event’s venue. Drawing on the aesthetic already present, the Society emerged as a slightly spooky, playfully ritualistic storytelling event where women convene on the full moon of each month to share their true, powerful and occasionally irreverent life experiences. Each event employs five speakers, one musical guest, a couple of artists, and a unique theme to bind the entire affair together. 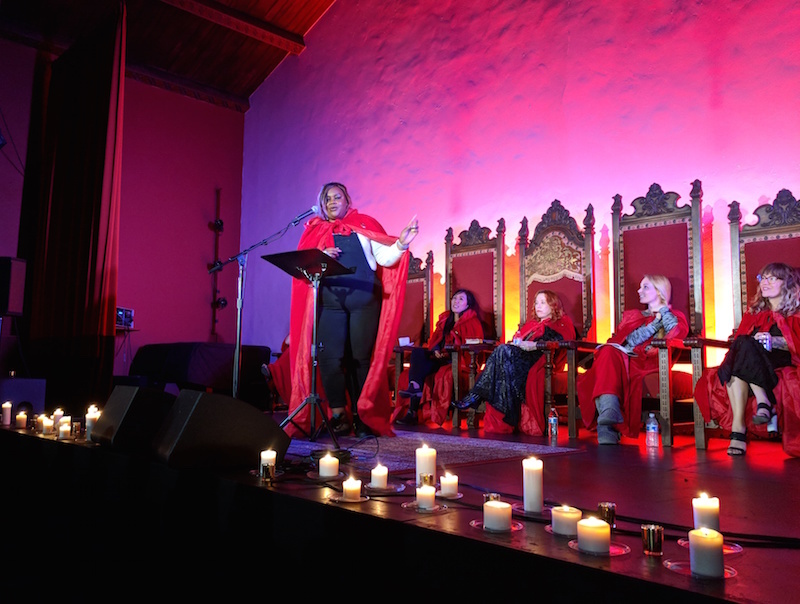 The Society’s inaugural night focused on the idea of “Reclaiming My Time,” while the follow-up drew from “I Thought I Was Going to Die.” Nelson said she likes to choose broad themes that offer room for interpretation. For example, one could see almost dying as, “the brink of boiling over with rage, or death by mortification,” Nelson said. “Through my career, I have pulled further away from scripted material and I really invested in breaking the fourth wall and having a room where there is no divide between audience and performer, where we sharing these stories together,” Nelson said. Each and every performance of the potentially morbid evening was brilliant in its own way. Poet and author Michelle Tea recounted an ill-fated road trip from a Michigan music festival to New Orleans during which she crashed at a friend’s place only to experience sleep paralysis and a series of odd dreams that later came true. Pamela Des Barres, legendary Sunset Strip groupie and author of I’m with the Band, recounted falling desperately in love with Paul McCartney and Mick Jagger from afar, the latter of whom she would eventually meet. Comic and actor Nicole Byer discussed the tragic death of her parents, which she coped with via “dead parent” jokes. Author Siel Ju read a prepared piece about getting dumped, rebounding, and moving on. It was the kind of night you dream to have in L.A. One where you unexpectedly connect with strangers and old friends, instead of sitting in your car or, in my case, on the bus with headphones on. It was precisely what Nelson intended. And if you really connect, the event is followed by the opportunity to socialize, enjoy complimentary wine, and purchase books and other materials from the performers of the evening. When choosing participants, Nelson selects speakers from all backgrounds. Although women-focused, the event is open to all genders. The previous moonlit meeting featured actor and author Mara Wilson; actor Busy Phillips; musician Marianne Jean-Baptiste; author Jade Chang; author Randa Jarrar; and Transparent producer/writer Our Lady J as the musical guest. April’s performers have yet to be announced, but you can check their site for future shows and lineups. 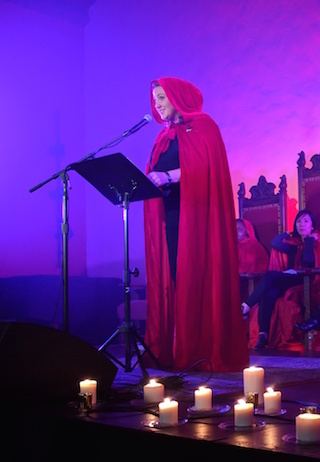 The Secret Society of the Sisterhood occurs monthly at the Masonic Lodge at Hollywood Forever Cemetery on the night of the full moon. The show begins at 8 p.m., with doors at 7 p.m. Tickets are $25 online or $30 at the door, with proceeds going to various women-focused charities.